Figure 4.14. KLIN cycle, thermally integrated turbojet-rocket. analogous to the rocket ejector ram-rocket-ramjet, with an additional benefit of excellent low-speed performance. Because of its lower thrust, a hydrogen-fueled turbojet is about equivalent in effective specific impulse in the transonic region to a hydrogen-oxygen rocket. In afterburner operation, the rocket outperforms the turbojet. Thermally integrated together the combination is better that the sum of individual engines, as demonstrated in Figure 4.16. The thermal energy from both the rocket and turbojet is used to power the expansion turbines that drive the propellant turbopumps. If there is remaining excess energy it can be added to a heat exchanger upstream of the turbojet combustor. The pre-cooled turbojet provides operation from takeoff to Mach 5.5 with rocket thrust augmentation when required, such as in the transonic region. Above Mach 5.5 turbomachinery is shut down and the rocket operates as a conventional cryogenic rocket. Figure 4.15. 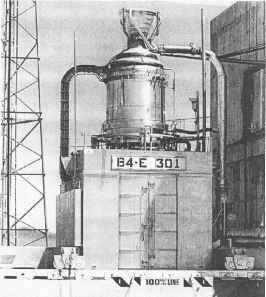 Airbreathing rocket thermally integrated combined cycle. be similar to the deeply cooled rocket. The airbreathing rocket operates only to Mach 6 or less, so the companion engine is a subsonic through-flow ramjet. In this cycle the thermal energy from the incoming air and hydrogen combustion is used to drive an expansion turbine that in turn drives a turbopump. A rocket motor combustion chamber heat exchanger is necessary to provide sufficient energy to drive the turbomachinery. After leaving the expansion turbine, the hydrogen is introduced into the ramjet combustion chamber. The inlet air is cooled to nearly saturation by an air-hydrogen heat exchanger, and then pressurized to a few atmospheres. It then flows into the pressurized liquefying heat exchanger. The turbopump pressurizes the liquid air to rocket operating pressures so it can be introduced into the rocket combustion chamber. After exiting the turbomachinery, the hydrogen is introduced into the ramjet combustion chamber. At Mach 6 or less, the rocket is essentially an airbreathing rocket operating in parallel with a ramjet. The ramjet can convert to a supersonic through-flow engine (scramjet) at Mach above 6, but the rocket is now a conventional cryogenic rocket, not an airbreathing rocket. Above Mach 6, the rocket is normally not used when the scramjet is operating. After scramjet shutdown the rocket operates as a conventional expander cycle cryogenic rocket. 8. Deeply cooled rocket-ram-scramjet. Figure 4.15 is the integration of the deeply cooled cycle developed by Rudakov and Balepin at CIAM and Alan Bond for HOTOL [Anon., BAC, 1991] with a subsonic through-flow ramjet. In this cycle the recovered thermal energy from the incoming air and hydrogen combustion in both the rocket and ramjet is used to drive an expansion turbine, which in turn drives a turbocompressor. The incoming inlet air is cooled to nearly saturation in an air-hydrogen heat exchanger, and then compressed to rocket operating pressures by the turbocompressor so it can be introduced into the rocket combustion chambers. A rocket motor combustion chamber heat exchanger is necessary to provide sufficient energy to drive the turbomachinery. After leaving the expansion turbine, the hydrogen is introduced into the ramjet combustion chamber. At Mach 6 or less, the rocket is essentially an airbreathing rocket operating in parallel with a ramjet. Above Mach 6, the rocket is normally not used, and the ramjet operates as a supersonic through-flow ramjet (scramjet). After scramjet shutdown the rocket operates as a conventional cryogenic rocket.